You don’t necessarily need to replace your whole garage door when it’s damaged. Sometimes when your garage door is down, only certain parts should be fixed. Maybe it’s just your garage door opener that needs repair because it’s making loud noise or not opening and closing properly. 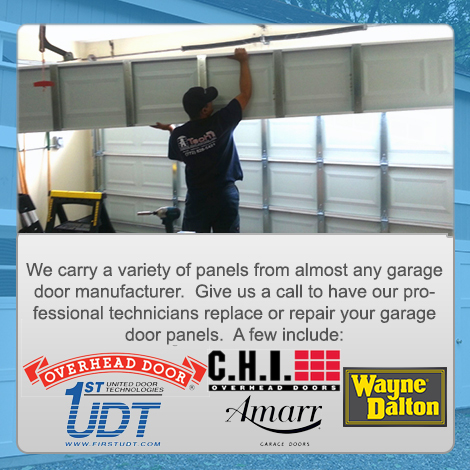 Perhaps an accident or bad weather mangles your garage door panels. The wheels on your garage door could fall off. Whatever the issue our experienced mechanics will pinpoint your problem and help you decide on the right solution. Garage door sensors are essential to your door’s safe operation. Using beams of light to recognize impending danger, sensors can trigger the garage door opener to reverse its direction to avoid accidents or injury. Malfunctioning sensors can be the reason your garage door won’t close or why it reopens immediately after shutting. Our certified technicians are available to perform inspections.